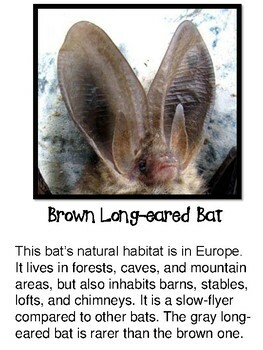 Bat pictures with informational text! 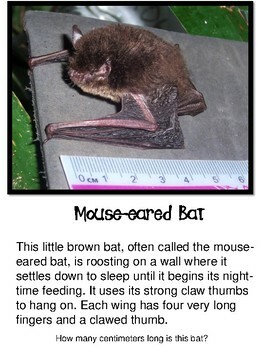 Here's a helpful teaching tool for your bat study. Six exciting 8 x 11 in. 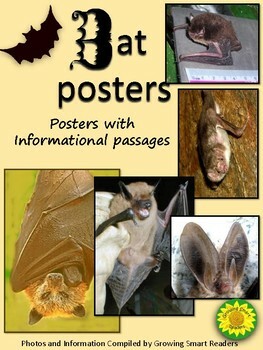 posters of real bats with informative captions. 1. Print out the pdf as a set of posters to put up around your room. 2. Bind them into a class BAT book. 3. Project the slides to your class using a document camera. 4. Use this as a simple, mini slideshow (without animations). Just scroll the pages in the pdf. 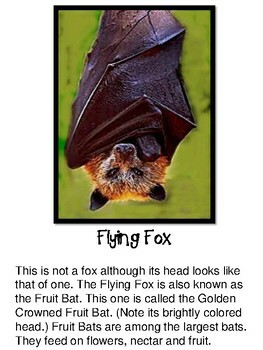 These colorful bat photos and paragraphs are intended to help supplement a classroom unit on bats--AND to save teachers time from having to hunt down and arrange these pictures and facts. I have used these in my own classroom, and my kids were fascinated with these creatures. The reading level (captions) is geared for students in grades 2-3. But the information in the short paragraphs makes it a high interest/ low vocabulary reading activity. Great for ESL kids. Use these posters to supplement your lessons and provide extra printable visual aids. Your kids will go batty over these, when they see them! The photos look best if copied in color. If you print them in color and laminate or slide into page protector sheets, you can use them year after year. I hope you and your students enjoy these. Please check out the National Parks link included in this file to discover more information. Photos were derived from public domain sources. I wrote the text based on a variety of sources. The text is general info since there are so many species with specific and varying characteristics. Each poster gives enough information to motivate kids to do a little more research and write a report.